The joy of adoption and bringing families together is presented in this tale. 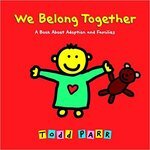 Parr, Todd, "We Belong Together: A Book About Adoption and Families" (2007). DIVerse Families. 317.